Explanation: Blown by the wind from a massive star, this interstellar apparition has a surprisingly familiar shape. Catalogued as NGC 7635, it is also known simply as The Bubble Nebula. Although it looks delicate, the 10 light-year diameter bubble offers evidence of violent processes at work. Below and left of the Bubble's centre is a hot, O star, several hundred thousand times more luminous and around 45 times more massive than the Sun. A fierce stellar wind and intense radiation from that star has blasted out the structure of glowing gas against denser material in a surrounding molecular cloud. The intriguing Bubble Nebula and associated cloud complex lie a mere 11,000 light-years away toward the boastful constellation Cassiopeia. 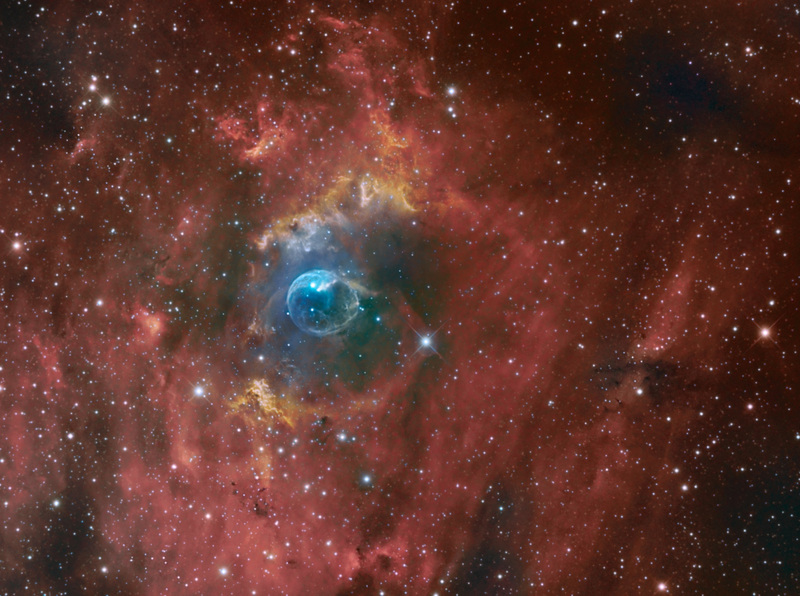 This tantalizing view of the cosmic bubble is composed from narrowband image data, recording emission from the region's ionized hydrogen and oxygen atoms. To create the three colour image, hydrogen and oxygen emission were used for red and blue and combined to create the green channel.